For the video game, see Scooby-Doo and the Cyber Chase (video game). Scooby-Doo and the Cyber Chase is a 2001 direct-to-video animated comic science fiction mystery film, and the fourth in a series of direct-to-video animated films based on Hanna-Barbera's Scooby-Doo Saturday morning cartoons. It was released on October 9, 2001. It features the Mystery, Inc. gang, which includes Scooby-Doo, Shaggy, Fred, Daphne and Velma. The film was produced by Warner Bros. Animation, but carries a Hanna-Barbera Cartoons, Inc. copyright and logo. It is the final Hanna-Barbera production to be executive produced by both William Hanna and Joseph Barbera before Hanna's death on March 22, 2001. It is also the fourth and final Scooby-Doo direct-to-video film to be animated overseas by Japanese animation studio Mook Animation. This movie, along with Aloha, Scooby-Doo!, was part of the first Scooby-Doo re-release on Blu-ray on April 5, 2011. This was also the first movie to feature Grey DeLisle as the voice of Daphne Blake after the death of Mary Kay Bergman in 1999. This was also the last film Scott Innes voiced Scooby-Doo and Shaggy, as well as the last film where B. J. Ward voiced Velma. A video game based on the film was released by THQ in 2001 for the PlayStation and Game Boy Advance. This is the first Scooby-Doo video game to be on a sixth-generation handheld. The Scooby-Doo movies would not feature real supernatural creatures again until Scooby-Doo! and the Goblin King. In a college computer lab run by Professor Robert Kaufman, two of his students; Eric Staufer and Bill McLemore are working when a virtual creature – the Phantom Virus – comes out of a new game based on the Mystery Gang's past adventures and tries to attack. The next day, Mystery, Inc. themselves come to the college and learn from their friend Eric that the virus had assumed a lifelike form thanks to an experimental laser which is able to transmit objects into cyberspace, and is now rampant across the campus. The gang goes on the hunt for the Phantom Virus, where the virus chases Scooby and Shaggy through the college. Unfortunately, the whole gang, including the virus, somehow gets pulled into the game after "someone" activates the laser. Left with no other choice, the gang fight their way through the ten levels of mystery and adventures to complete the game in order to escape it, with the goal of finding a box of Scooby Snacks to complete each level. Their efforts are impeded on each level by the Phantom Virus. The first level is on the Moon, second is in the Colosseum, third is in the dinosaur age, fourth is under the sea, fifth finds the gang shrunken in a backyard, sixth is in ancient Japan, seventh is in ancient Egypt, eighth is in a medieval fantasy setting, and the ninth is in the North Pole. After a while, they finally reach the game's tenth and final level, where they meet their virtual counterparts who resemble themselves from previous series, with the exception of Scooby. They team up to confront the Phantom Virus, who wreaks havoc across the final level and summons his henchmen – five villains from the gang's past: the Creeper, Jaguaro, Gator Ghoul, the Tar Monster and Old Iron Face. To make matters worse, all the monsters are real. The climax takes the two gangs to an amusement park, where they fight off the creatures and attempt to retrieve the last box of Scooby Snax. During the fight, they use magnets to fight the virus, whom they discover is severely weakened by magnetic forces. 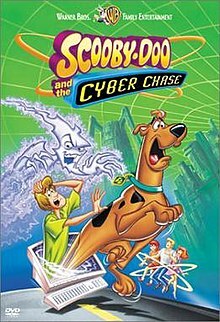 Cyber-Scooby distracts the virus long enough for the real Scooby Doo to retrieve the Scooby Snax, thus winning the game and deleting the monsters and the Phantom Virus once and for all. The real gang bids farewell to their virtual selves and head home. Back in the lab, the gang reveals that they now know the culprit, who turns out to be Bill. Bill is arrested by Officer Wembley and confesses that he created the virus to scare Eric away and take all the credit for inventing the laser. He was outraged when Kaufman chose Eric's video game design over his own baseball-themed video game, despite Bill being at the college two years longer, and he felt more deserving to win the prize money at the university's science fair. Kaufman then protests that students alike are all equal. Bill was the one who beamed the gang into the game, as he feared they would find out that he created the virus. The gang and Eric play the new Scooby-Doo game, during which Scooby interacts with the gang's virtual counterparts once again by feeding Cyber-Scooby some Scooby Snax. The post-credits scene includes the gang telling the audience what their favorite parts of the movie were. Scooby-Doo and the Cyber Chase was released October 9, 2001 for both VHS and DVD formats. The film was re-released on Blu-ray on March 29, 2011. This was the first animated Scooby-Doo film to be produced in the high-definition format. Scooby-Doo! and the Legend of the Vampire was released on March 4, 2003. ^ "Scooby Doo and the Cyber Chase". 7 February 2006 – via Amazon. ^ "Scooby-Doo and the Cyber Chase". Retrieved 2 November 2014. This page was last edited on 4 April 2019, at 22:33 (UTC).